The Australian sharemarket is likely to be largely driven by Federal Budget initiatives announced on Tuesday night, particularly in relation to the banking industry and the residential building and civil construction sectors with the latter potentially benefiting from plans to improve housing affordability and the government’s commitment to increasing investment in transport infrastructure. There weren’t any significant developments in overseas markets in the last 24 hours that would necessarily take the focus off the budget to any significant degree. 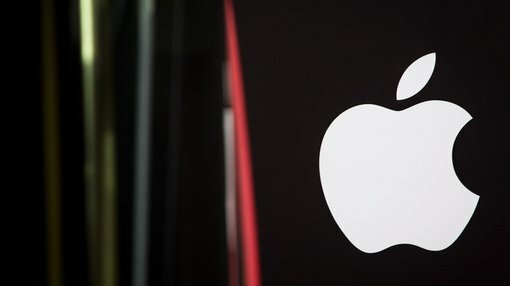 The Dow came off 0.2% to close at 20,975 points, while the NASDAQ gained 0.3% to close at 6120 points as Apple Inc. became the first US company to hit the $800 billion market capitalisation level. 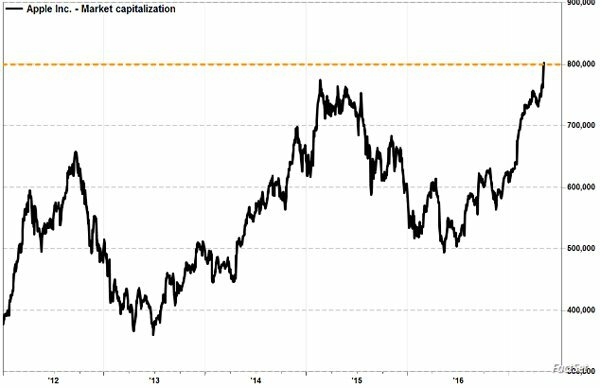 The following chart shows the marked acceleration in Apple Inc.’s market capitalisation growth over the last five years with it racing from the US$600 billion level to US$800 billion. Elsewhere, European markets regained momentum with the FTSE 100 gaining 0.6% to close at 7342 points, led higher by strong performances from mining companies including Glencore plc, BHP Billiton plc and Anglo American plc. The DAX rallied more than 0.4% to close at 12,749 points, representing an all-time high. This was mainly in response to impressive trade figures which showed exports increased 0.4% in March to a record 118.2 billion Euro. The Macron factor continued to have a positive impact on markets in France with the Paris CAC 40 climbing 0.3% to close at 5398 points. On the commodities front, oil came off 0.5% as the Energy Information Administration (EIA) raised its forecast on 2017 US crude oil production and lowered its price outlook. Gold shed 0.5% to close at US$1221 per ounce. Iron ore gained 1% to US$60.75 per tonne, and most base metals gained ground, albeit with fairly nominal appreciation. Nickel and zinc were the best performers as they gained circa 0.8% with the latter pushing up towards levels that it hasn’t traded at since early April. The latest run in the zinc price has been supported by declining London Metals Exchange zinc warehouse stock levels, suggesting the rally could be sustainable. The Australian dollar was sold down heavily overnight and is currently fetching less than US$0.735 (a four month low), a factor that could provide additional momentum for Australian-based mining producers when the market opens on Wednesday. Looking specifically at the downturn in the gold price over the last three weeks, as it has fallen from approximately US$1290 per ounce to US$1220 per ounce, the decline in Australian dollars isn’t nearly as pronounced. While the precious metal has come off more than US$70, taking into account the fall in the Australian dollar it has only declined by $37 an ounce. Consequently, there could be buying amongst Australian gold producers that have been sold down amid negative sentiment towards the broader sector. Some of the local producers that have been hard-hit recently include Northern Star, Saracen Mineral and Regis Resources. Independence Group and Sandfire Resources could also receive support today given their exposure to the Australian dollar gold price, as well as a recovery/steadying in nickel and copper respectively.